Can a Jos. A Bank suit win the White House? A two-for-one suit promotion could help seal the deal in 2016. Presidential hopeful and Wisconsin Governor Scott Walker boasted in New Hampshire last weekend that he shops for suits at Jos. A Bank. It's famous for its huge discount deals. "All suits -- Buy 1 get 3 FREE" reads the site's current promotions. 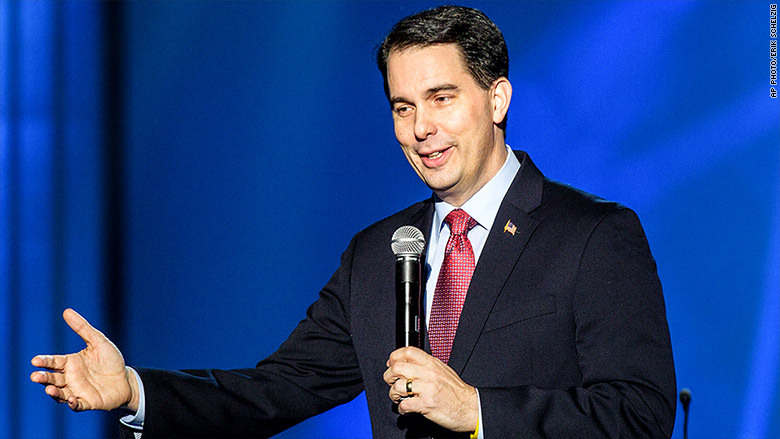 Walker is using his everyman wardrobe to resonate with middle class voters. "The shirt is from Kohl's. The suit is from Jos. A Bank," Walker, a Republican, told a crowd in New Hampshire over the weekend. It's a similar tactic to how Bill Clinton appeared frequently at McDonald's in the 1990s to show his man-of-the-people credentials. But Walker isn't the first major public figure to tout his fondness for Jos A Bank. Former Federal Reserve Chairman Ben Bernanke told Time magazine that he actually carries a Jos A. Bank credit card wherever he goes (you never know when you'll see a three-for-one steal). "I've got a D.C. driver's license, my American Express card, a debit card, a Jos. A. Bank card where I get my suits, I have a health insurance card" Bernanke told Time in 2009. It's possible Bernanke may be upgrading his suits these days. He is now paid $250,000 for some speeches and recently joined hedge fund Citadel as an advisor. So what suits do other presidential hopefuls wear? Does the suit say anything about them or their policy? We don't know. Spokespersons for Republican Senators Marco Rubio and Ted Cruz did not respond for comment. Senator Rand Paul's spokesperson declined to comment. (Disclosure: this reporter wears a Jos A. Bank suit). While female politicians have long complained about the focus on their appearance, it's a sign of the times that male candidates now tout their own wardrobe choices. While brands like Armani and Burberry can fetch thousands of dollars for a suit, the average suit sold at Jos A. Bank cost $225 last year, according to Jos A Bank's parent company, Men's Warehouse (MW). Bernanke and Walker could be ahead of the men's fashion trends this year. Sales at Jos A. Bank have declined for the last three years, but it's positioned for a major fashion overhaul this year, according to the parent company. Stores now offer tuxedos rentals and more custom tailored clothing. Mens' Wearhouse's stock is up 26% this year. The stock was only up modestly on Monday after Walker's comments. "This is a transition year for Jos A. Bank," Jon Kimmins, CFO at Mens' Wearhouse, said during a recent earnings call. Will it be a transitional year for Walker? It is so far for Bernanke: he just started a blog, joined a hedge fund and has book coming out in the fall. There are no details yet about Jos A. Banks' role in the memoir.